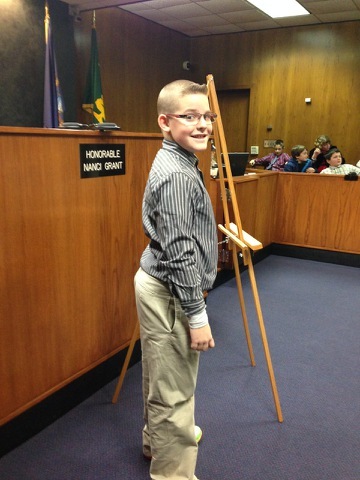 Drew's class took a field trip to the Oakland County Courthouse to hold a mock trial on Friday, December 13th. They were to decide if Plankton was guilty of trying to steal the secret Krabby Patty recipe from Mr. Krabbs. Of the three classes that held mock trials today, Drew's class was the only one to acquit Plankton. 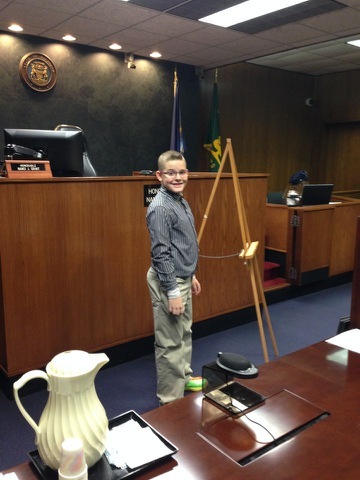 Drew was given the duty of putting the exhibits onto the easel during the trial. He dressed appropriately for the part, and thanks to a friend (who happens to be an Oakland County Sherriff) we were able to get a couple photos of him as he was getting prepared for duty. Drew looking good in his dress clothes before the trial. A closer look at Drew in the courtroom.